Hope you all had a good Labor Day long weekend. 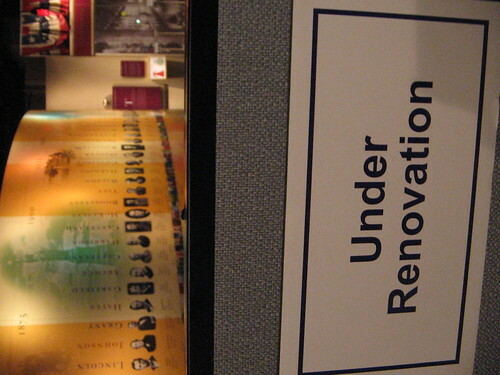 Today was the last day to visit the Smithsonian National Museum of American History before it closed for renovations till 2008. 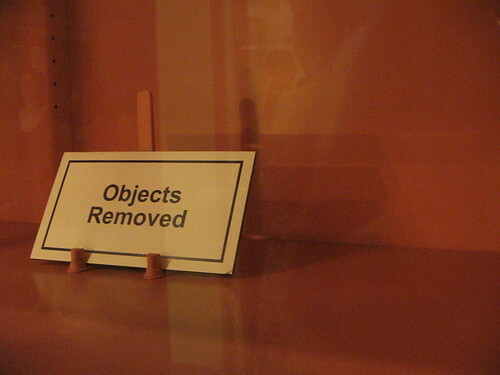 Many exhibits and displays had already been shuttered or emptied. I spent most of the weekend hanging around there, snapping photos of whatever was still open, trying to soak it all in before the place as we know it today disappears for the next two or more years. In a way, I’m glad it’s being renovated. The Behring Center (named for philanthropist Kenneth E. Behring) was originally built to house what was called “The Museum of History and Technology,” and only later refocused on American History in 1980. Much of the museum, especially the ground floor, is still oriented towards science, technology, and industry — topics like computers, transportation, materials, maritime enterprise, and the industrial revolution. Great stuff for my geeky interests, but the museum still fails to offer a real overview of American History in general, and that needs to be fixed if it is to live up to its current name. So farewell for now to the NMAH. Here’s hoping it reopens on time in 2008. (Yeah right.) For the time being, a large exhibition hall in the National Air and Space Museum will be devoted to “Treasures of American History”, featuring various items from the NMAH collection while it renovates. Read more on the history of the NMAH, and see my full “NMAH Farewell” photoset here.